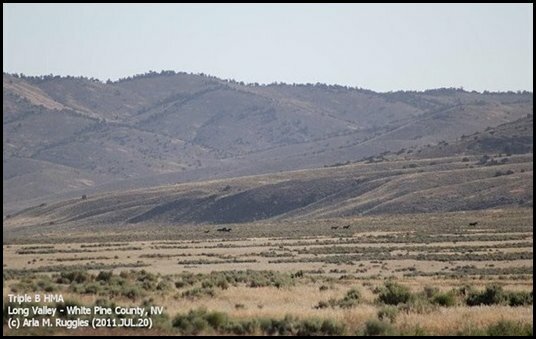 at the end of this post: on-the-spot reporting of the BLM wild horse roundup held on August 27, in Butte Valley, Nevada. “Another year passes, for some with regret, for others with relief, only too pleased to see it gone. Nevertheless, each passing year seems always not only to throw up its fair share of tragedy, 1997 was certainly no exception but also some truly magical moments. “Picture, if you will, a fine, warm, sunny East Devon day, a windless, almost breathless, day. The yard at the Sanctuary, although full of donkeys, has the air of quiet contentment. It’s early—only a few visitors have arrived; maybe the staff and donkeys realize it’s just the calm before the storm and are making the most of it. “We sit on one of the benches, just looking, alone with our own thoughts, the tranquility of the moment belying the suffering that had gone before. Can these wonderful animals ever trust again, can they ever forgive their tormentors? You could forgive them if they could not. “Cabbage breaks the stillness and, with an air of insatiable curiosity, wanders nonchalantly over to a child in a buggy. Gently she placed her head on the child’s shoulder as if whispering some long-held secret in its ear. Child and donkey held this position for some considerable time. We watched …. the child’s father watched from a distance …. neither wishing to destroy the moment …. what would happen next? “Obvious, really. Cabbage’s secret now safe, she did what all good friends do. She took half a step back, bent forward and placed an approving kiss on her new friend’s cheek. Anthropomorphic? Maybe, but I’d like to think not. No audible sound was exchanged between the two, but communication, yes, I’m sure. “I often wonder what the secret was, but it was never mine to tell. For a brief moment in time, I was excluded. It was a moment of tenderness, affection, and trust. I did not … could not understand. I could only feel the magic. 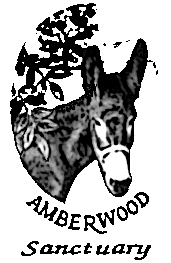 “As far as my questions of earlier were concerned, it would appear that if you are very lucky, donkeys will show you unconditional love and trust and seem to forgive without a second thought. grassrootshorse.com editor: This report covers the capture of two bands of wild horses; however, one of those bands breaks free. 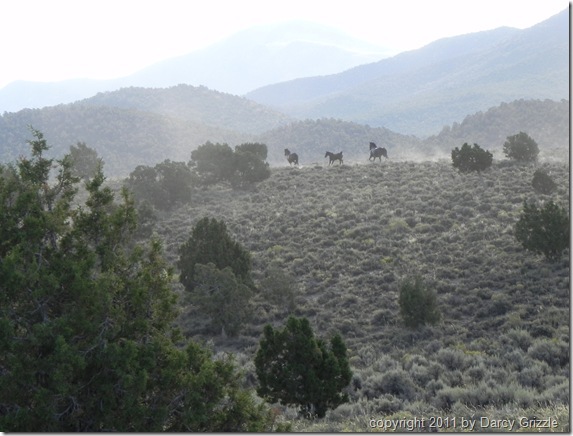 The morning roundup operation began with a pre-dawn (4 a.m.) meeting at the Town Green in Ely, Nevada. BLM personnel met with those who were there to observe. We had been informed that it was media day but no media were in attendance. 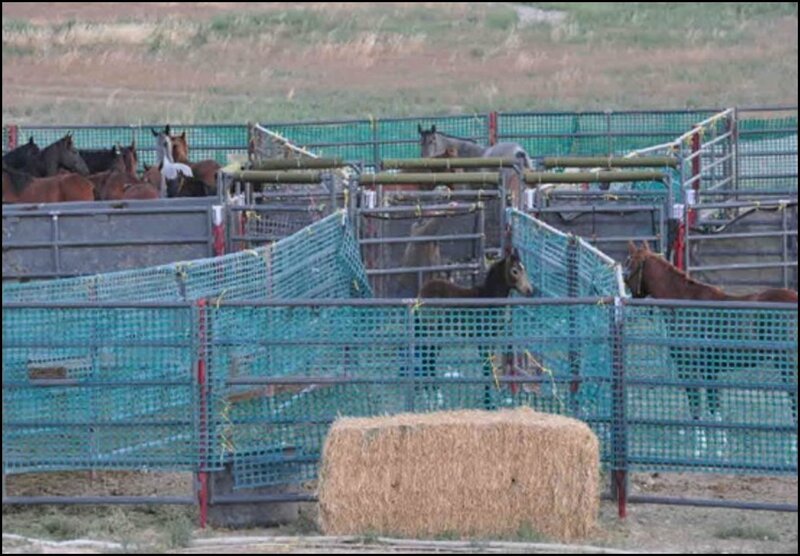 We are informed that no horses will be shipped that day from the temporary holding pens. 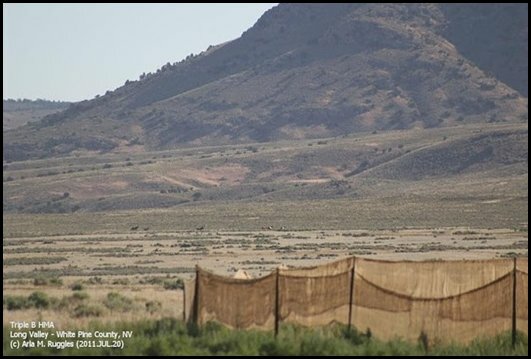 We go directly to the trap site location on Butte Valley Road. Observing the roundup were six BLM personnel and three members of the public. Additional observers were our photographers in remote, non-visible locations, who were able to photograph the entire scene of action by using a super zoom telephoto lens and high resolution video cameras. 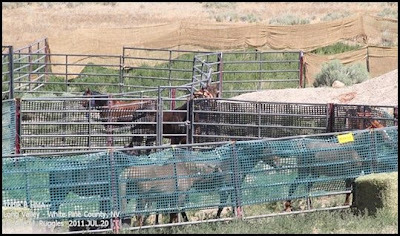 The abuse that these and other federally protected wild horses were subjected to began at 6:06 a.m., well out of public view. 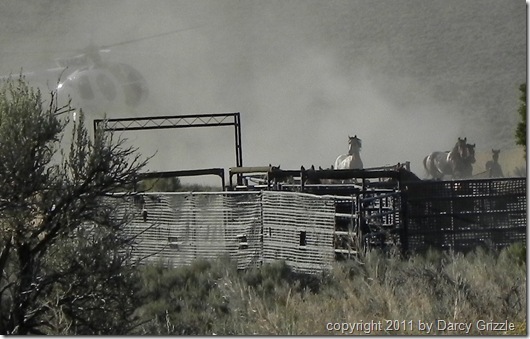 These are only some of the photographs that show what these horses endured during, what is in my opinion, a targeted assault by the BLM’s contracted helicopter pilot, a pattern of cruelty and abuse repeated throughout the time we covered this roundup. 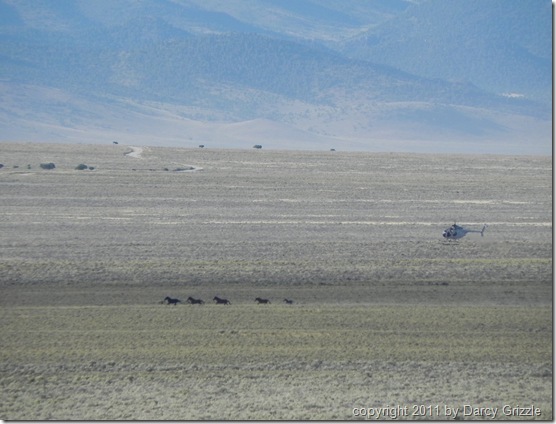 We witnessed the helicopter chase a band of what appeared to be eight, possibly nine, horses. There seemed to be a great deal of chaotic activity as the horses were driven in multiple directions during the time they were in our view. Horses were repeatedly split from the band and chased in multiple directions. The horses appeared to be under a great deal of stress, were soaked with sweat, and appeared exhausted. 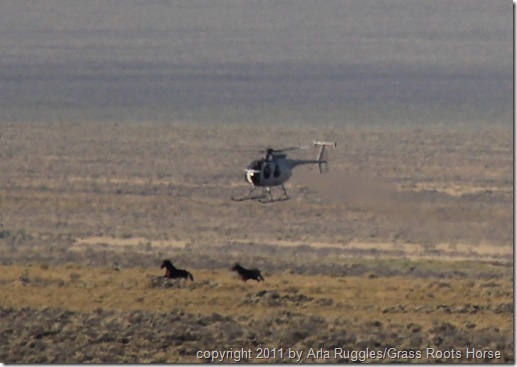 The helicopter splinters the group, and the horses are chased in different directions, back and forth, many times. Some of the horses ran in the direction that was behind us, and we could see and hear the helicopter hover directly above the hill, as well as on the other side of the hill and just out of our view. We could see dust flying, as well. 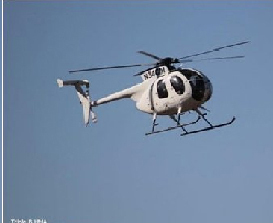 You can see the jute trap wings crossing the road behind the helicopter. It is evident why the horses are dripping in sweat. 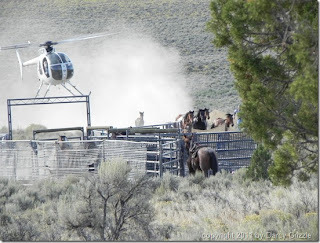 The helicopter pilot follows his usual pattern, which still remains unchecked by the BLM or law enforcement, of breaking apart bands of wild horses and then targeting specific horses. 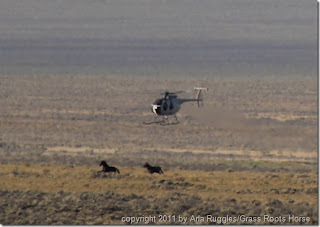 The assault shown here is only a segment that began at 7:12 a.m. when he began to harass a group of eight wild horses. The horses were captured at 7:29 a.m. 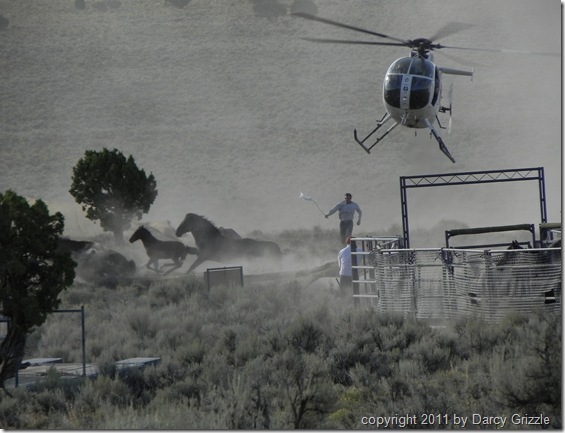 The pilot continuously challenges some of the horses and cuts them apart from the rest. He repeatedly dives down at the horses and flies dangerously close. Often, it appears he is losing control of the aircraft as it dips and sways, unsteady in the currents he creates by his actions. 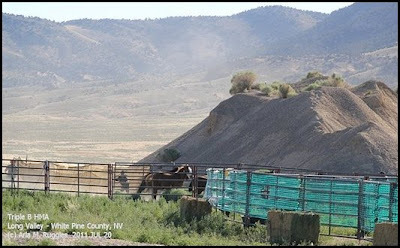 The wild horses change directions to find safety, and it appears to me that it angers him and he continues the pattern of abuse even more aggressively. To me, this seems more like he is hunting horses, not herding them. Look closely to see the foal behind the light colored horse right underneath the skids. The pattern of chasing the wild horses back and forth, splitting and targeting horses continues. Another man is in the cockpit with the pilot, who I believe to be John “Jake” Holmes, owner of Sun J, the helicopter contractor, and Pilot Josh Hellyer’s boss. A complaint was filed with the White Pine County Sheriff’s Office. In this specific sequence, this goes on for 25 minutes and is not an isolated instance but has been the documented “norm” throughout the roundup. At the trap wings, which is the entrance to the trap, the pilot makes a severely aggressive push to the lead horse, which is really what I would call an attack. This is just out of view of the observers. 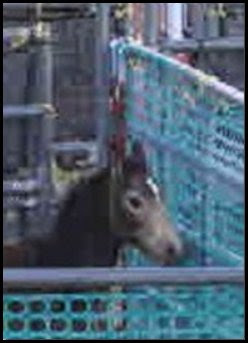 This is the horse who had been aggressively pushed into the trap wings. 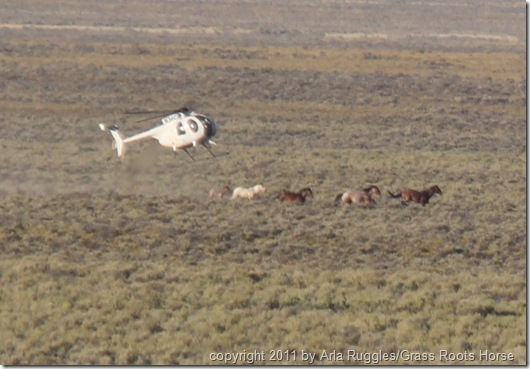 These horses had been overrun aggressively for 25 minutes just prior to their capture. Photographic evidence shows they had been in small groups that had been run repeatedly with other bands prior to that. The aggression escalates. My opinion is the pilot knows the public observers have minimal viewing because of their restricted observation area. 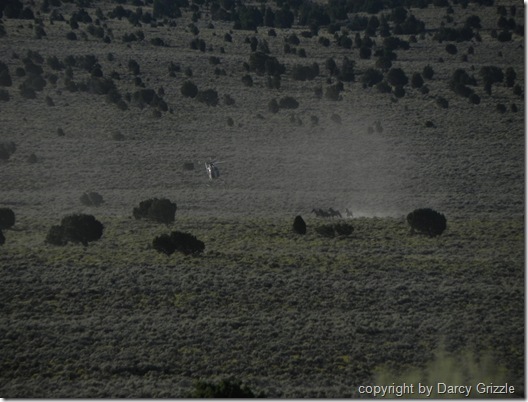 Our range photographers, however, documented the pilot running wild horses up and down the hillside. 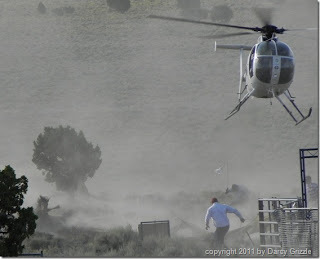 Photographs taken from the observation area, as well, show the helicopter flying low on the top of the hill and behind it. 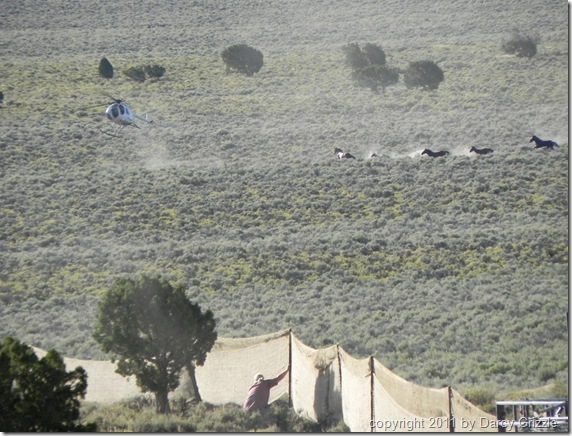 The wild horse and burro specialists, Ben Noyes and Ruth Thompson, are in constant radio contact with the pilot and ground crew, as is the public relations person, Chris Hanefeld. If they did not know this was happening, then they certainly should have known. 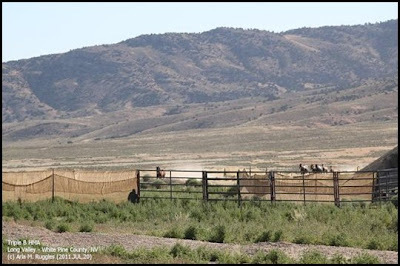 It is the responsibility of Ben Noyes and Ruth Thompson to ensure the safety and humane treatment of the wild horses at the roundups. 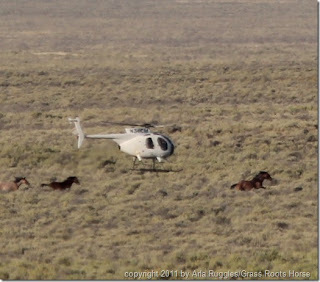 The helicopter could be seen coming into view, very low to the ground, and three adults and one foal were captured. I believe they were from the band that had been run down and split apart during the long chaotic runs. As viewing was so limited at the trap, there may have been a fifth horse who escaped before entering the trap. 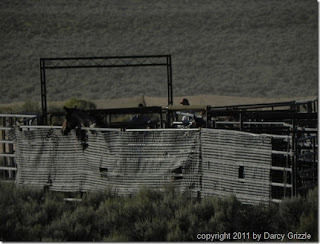 The wild horses are soaked in sweat and appear disoriented and exhausted. Notice the young foal to the right. 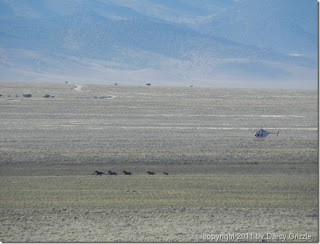 Into view came a small band of five horses, four adults and a young foal, being chased by the helicopter. Based on all of our photographs, I believe they may be the other half of the band broken apart earlier that had been chased for quite a long time—close to 45 minutes. This band was chased in several different directions, back and forth in a chaotic manner, with horses falling as the helicopter flew close. These horses also appeared very exhausted, stressed, and were visibly lathered and dripping with sweat. Foal behind lead horse struggles. Chaos ensues as the helicopter pilot gets way too close and pressure scatters the struggling band. The horses entered the trap site and appeared to almost stop in confusion and exhaustion. They were clearly lathered and drenched in sweat. 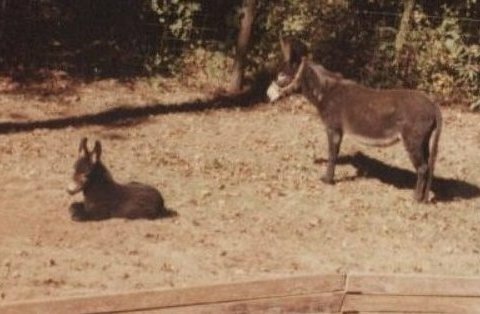 The foal, seen to the left, is still with the band. The horse to the right breaks straight through the jute. The other four, including the foal, managed to break through the jute to the hillside side. The wild horses get back on their feet and take off up the hillside. The helicopter continues to give chase and pursues them over the hill. Shortly after, we are informed that the trap is being moved to a location farther down the road. 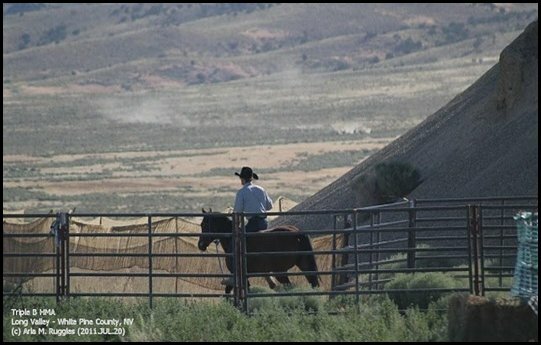 Late Tuesday, August 30, 2011, U. S. District Judge Howard McKibben denied a request to halt the BLM’s Triple B Complex roundup in Northeast Nevada, but he did issue a rare emergency Temporary Restraining Order banning the continuation of the documented mistreatment of the wild horses being captured. 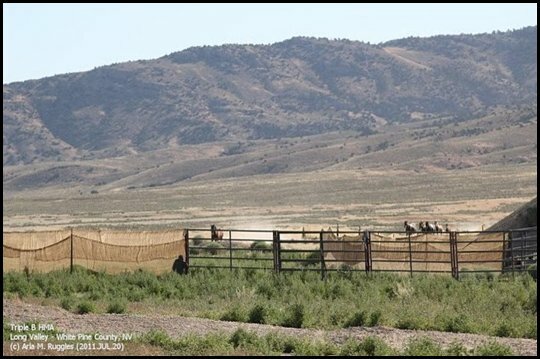 This particular roundup, originally scheduled to begin on July 6 and end on August 22, began on July 20 and was completed on August 31, with 1,269 horses being captured. 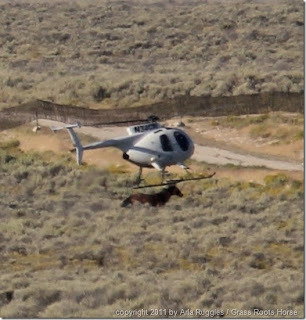 It was handled by Sun J Livestock of Vernal, Utah, with the use of a helicopter. 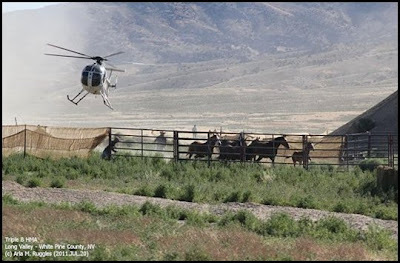 In his decision, Judge McKibben cited misconduct that was in violation of the Wild, Free-Roaming Horses and Burros Act by the helicopter pilot working the capture. 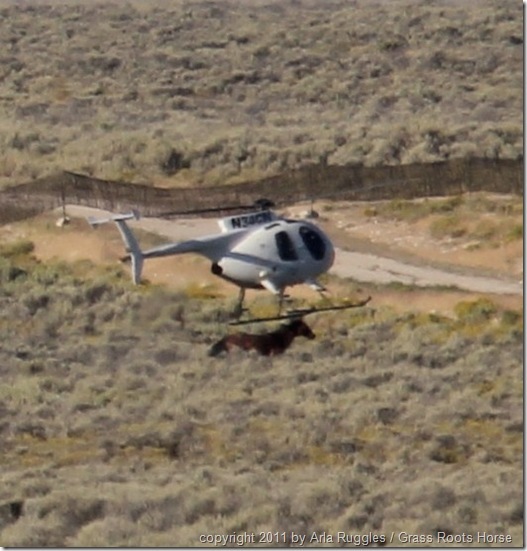 BLM officials denied the claim that the helicopter pilot actually struck a horse with a helicopter skid on August 11, that was evidenced in the video taken by plaintiff Laura Leigh, vice president of the Texas-based group, Wild Horse Freedom Federation. Now, in its September 23, 2011, news release, BLM Director Bob Abbey announced that he is calling for a review of the adequacy of existing operating procedures that relate to instances of alleged animal abuse during the recently completed Triple B wild horse “gather” carried out in Nevada in a complex northwest of Ely and southeast of Elko. The BLM’s 2011 summer roundups ended on September 30 (the end of their fiscal year). Their tentative roundup schedule for fiscal year 2012 proposes the round up of 7,976 mustangs, with the removal of 5,727. Their schedule also shows 661 wild burros to be rounded up and the removal of 611. If these figures are adhered to, this would show somewhat of a drop in the number of animals rounded up and removed in comparison to fiscal year 2011. 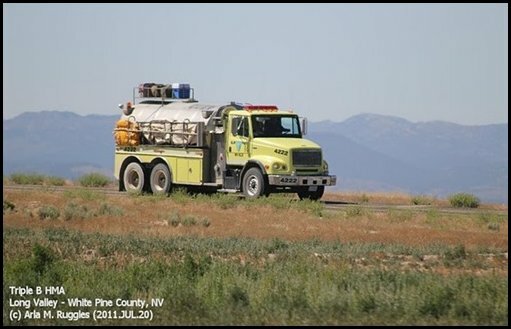 More later when final figures for fiscal year 2011 are available. Everyone at Amberwood Sanctuary is doing well except for the usual little things: Tommy (dog) has an ear infection; Jake (donkey) has a somewhat bad bite on his neck from fighting with another jack; Audrey (dog) has an eye infection; Emma (rabbit) has an allergy causing her to sneeze a lot. I think that’s about it. Oh, my allergies are driving me crazy. We’re all happy the 100 degree weather has finally ended. The 90’s seem almost cool in comparison. Work is progressing on renovating our old barn. The foundation has been repaired and the building has been pulled back to plumb. Here’s Clancy helping me take care of the correspondence for Amberwood Sanctuary. I can’t believe he’s 16 years old. He still acts like a kitten most of the time.